When it comes to a list of intelligent animals most people would not expect to find the octopus. In fact this animal is extremely intelligent. The kid friendly information below list facts about how smart this sea animal is along with other facts like where it lives and how it survives. 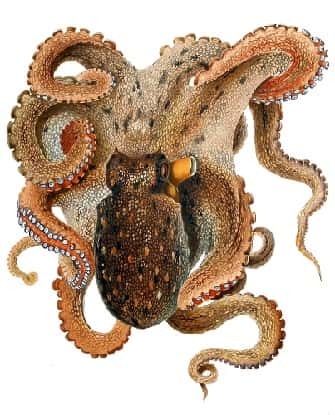 Click here for a great selection of Amazon.com books about octopuses. Scientific experiments have shown that an Octopus can learn to distinguish between different patterns and shapes. Some species of octopus have been observed using coconut shells to build shelters. This animal is the only invertebrate that uses tools. Experiments have shown these invertebrates have an excellent memory (both short and long term memory). It should be noted that these findings are disputed. The Octopus is a cephalopod mollusk; order Octopoda. The word octopus comes from the Greek word oktapous meaning "eight-footed". The plural for Octopus is octopuses, octopodes, or octopi. There are approximately three hundred species of Octopus. Most octopuses live on the ocean floor hiding in coral and rock crevices. They can be found in almost every ocean in the world. Octopi have a varied diet which often depends on the particular species. Their diet includes fish, crabs, clams, plicate worms, whelks, and prawns. Some large species have been known to attack and kill small sharks. This animal has numerous means of defense against predators such as sharks including camouflage, expulsion of a black thick ink, and speed. Some species like the mimic octopus have another amazing defense. They can change their color and shape their flexible bodies to look like a more dangerous marine animal that the predator would avoid. The thick ink cloud most species eject when being pursued by a predator helps shield their escape and is also believed to affect the ability of some predators to smell them. These creatures swim headfirst, with their arms hanging behind them. Octopuses have two eyes and eight arms. They have a hard sharp beak near its mouth at the center point of where the arms meet. The largest species of octopus is the Giant Pacific Octopus (Enteroctopus dofleini). The average weight of a full grown member of this species is 33 pounds (15 kg) with an arm span of 14 feet (4.3 meters). They have no skeleton which enables them to squeeze through tight places. These marine animals have a short life span. Depending on the species they can live anywhere from six months to five years. The main reason for this short life is that both the males and females die due to reproduction. The females die from starvation due to not eating while caring for their unhatched eggs. One of the most interesting Octopus facts is that they can actually taste what they touch. This is made possible by chemoreceptors (sensory receptors) on their suction cups. All species of octopuses are venomous. In fact the Blue-ringed octopus is one of the most venomous animals in the world. A bite from the Blue-ringed octopus can kill an adult human.